This week the team at PetCure Oncology celebrates autumn with tips for keeping your pets healthy as the weather turns crisp and cool. Read on and you’ll find suggestions on preventing ticks, averting Halloween candy hazards, avoiding snakebites and limiting holiday plant dangers. – The team at Catster asks… are you ready to enjoy fall with your cat? 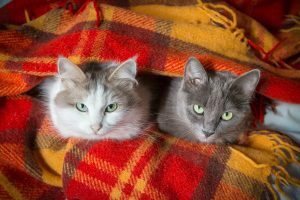 Catster Tips: How to Keep Your Cat Safe This Fall covers a variety of things to keep in mind as the temperature drops and the holiday festivities begin. – Pet Health Network rounds up their Top Pet Health Tips for Autumn, addressing everything from wild mushrooms to tick prevention and fall decoration mishaps. A little prevention can go a long way in keeping your pet safe. – Depending on where you live, this isn’t just autumn it’s also snakebite season. Embrace Pet Insurance offers 7 Autumn Health Tips for Dogs and Cats and raises awareness on the need to be on the lookout for venomous snakes. – Fall brings chilly weather and cozy family evenings by the fireplace, but it can also bring seasonal dangers for your cats and dogs. Hartz lists 11 Fall Pet Dangers to Avoid, highlighting ways to enjoy the season while keeping our furry family members safe.